As I write this, countless aspiring college and graduate students are mulling over financial aid offers from US schools. And a great many of those aid packages include sizable loans. Given that I've counseling numerous musicians who took on too much debt and then regretted their decisions, I want to share with the Violinist.com community some key guidelines to help students pursue their educational dreams without taking on disproportionate debt. What's a Reasonable Amount of Student Debt? If students abide by that benchmark, after graduating, they can pay off their loans over a decade and have ample money for necessities, mortgages and cars as well as to fund retirement. Given that music degrees come with ample intrinsic but modest monetary value (1st-year earnings of master's degree graduates average about $30,000*), it's unwise for financially needy music students to rack up nearly $84,000 in debt. Even so, I regularly coach music graduates with almost double that amount of debt, and all of them could have obtained excellent educations without over-borrowing, if they had known how. The following 10 strategies help students steer clear of crippling debt. I'm gearing them toward musicians, but the concepts apply generally to students in every discipline, so feel welcome to share them. 1. Just say "no" to big debt. If you don't get sufficient scholarship funds to attend a school without going heavily into debt, don't enroll. Work part time, study, and then reapply the following year. Your work experiences, professional recommendations, and ongoing study will make you more competitive for scholarship funds. 2. Attend a low-cost school, and then transfer. If you're a rising freshman and you're admitted to a low-cost school with a sizable scholarship but don't receive funding from top schools, attend the affordable school, earn stellar grades, and then apply to transfer as a sophomore. If you still don't receive much funding from your preferred schools, continue at the lower-cost school and apply to transfer again as a junior. You also might use your tuition savings to help fund summer study or to pursue a volunteer internship, whether in the music field or another area of interest. 3. Take advantage of in-state tuition. If there are high-quality, state-funded schools in your home state, apply to those - even a moderate amount of scholarship can cover much of your costs. Post-college students who lack satisfactory graduate programs in their home states can relocated to states with top-notch offerings and earn residency. Establishing residency may take 12 months, but students should check a state's current requirements. During the pre-residency period, individuals can work and build up additional qualifications for scholarship and assistantship awards. After becoming residents and gaining admission as in-state students, they save tens of thousands of dollars in tuition costs. 4. Do research and get feedback. Before applying either to undergraduate or graduate programs, research the higher education marketplace in your field and have your performance level evaluated so that you can gauge your competitiveness for scholarships. You might also participate in summer music programs that enable you to study with faculty who teach at the schools you aspire to attend. If, after upgrading your skills, you still aren't competitive for scholarships, it's reasonable to conclude that you're unlikely to be competitive in the music performance profession after graduating, so you can change career directions, still enjoy music as a non-major, and you won't be encumbered by debt like the misguided opera singer quoted above. 5. Budget for the long term. Calculate your costs across both your undergraduate and graduate educations. Don't over-spend or over-borrow for undergraduate school. 6. Appeal low scholarship offers. If an initial scholarship offer doesn't suffice, respectfully request more funds. Keep appealing, if necessary. 7. Develop income-producing skills. While in school, gain diverse skills and access a school's career office so that you can earn income in multiple ways during and after school. You might explore income-earning avenues in both music and non-music fields. 8. Get impartial advice. If, despite what's written here, you find yourself considering hefty loans to enroll at a school, seek advice from impartial mentors before you commit. Don't lean on the advice of a music studio teacher with whom you might study because such teachers often can't be impartial (e.g., if your enrolling would help them meet their studio enrollment quotas, then they would profit from your borrowing). 9. Access family funds. Families that have the means usually save to pay for the educations of children and grandchildren. If your family can support you, graciously accept the help. 10. Be hopeful yet practical. 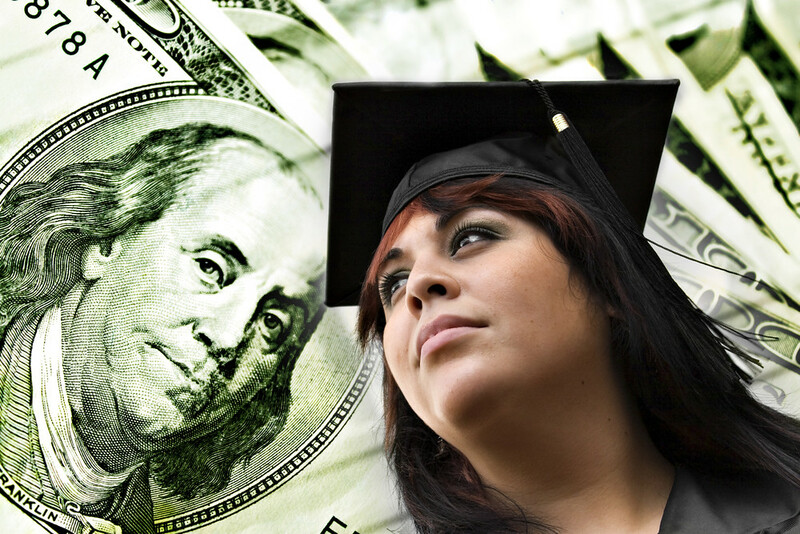 The funds available for scholarships at a given school aren't necessarily constant from year to year - amounts may vary depending on how many funded students graduate. If funding is denied to a qualified applicant once, it doesn't mean that funding will be denied the following year. If you know that you're highly qualified for a scholarship, be hopeful but also practical, and, whatever you do, don't over-borrow. In sum, the U.S. is full of excellent colleges, universities and conservatories. By using these sorts of guidelines, students can graduate well-educated and also free of encumbering debt. In addition, it's vital that students educate themselves regarding the employment outlooks in their fields of interest. For instance, full-time orchestral jobs are very scarce, and music schools graduate vastly more qualified orchestral performers than can be employed. Yet jobs in education, software development and numerous other fields are plentiful. So even when students receive full scholarships to study music, there is an opportunity cost involved in their choice of study. Hence, it's wise for students to learn as much as they can about themselves and about the professions that appeal to them so that their educational choices will empower them to be both happy and financially secure. The following links can help students learn more about the loan and job markets. See The Musician’s Way for guidelines to building the inclusive skills needed for success in the music world. *For more information about music and arts graduates, see the Strategic National Arts Alumni Project (SNAAP). April 26, 2017 at 08:03 AM · With the absurd costs of the US ed system, it is sometimes cheaper to move to another country and study there. April 26, 2017 at 03:32 PM · "This is obviously a bubble and it will pop"
I think you're describing something totally different. The student loan market may be some kind of "bubble" (if that's the correct term, something I doubt), but the market for professional classical musicians is a "pyramid" or "lottery," in which a lucky chosen few do really well while the rest barely get by. Frankly, I see music schools lumped in with other expensive art schools, including photography, acting, film schools, etc. The dilemma for music and art students is that they need to ask themselves whether they are willing to be in their field come-what-may, or whether they envision some minimum standard of living they may need later in life. The dilemma is that 17- and 18-year-olds are not really equipped to make that decision because our values and priorities may radically change from 18 until 30 or 40. Gerald, I'm skeptical of this statement: "1st-year earnings of master's degree graduates average about $30,000." It's like saying that if you have one foot in a bucket of ice water and the other in a bucket of hot water that your average temperature is comfortable. April 26, 2017 at 03:42 PM · No, I meant the ed costs, regardless of the profession. The loan system only sustains because the prices for higher education are exorbitant. April 26, 2017 at 04:28 PM · Well, it's feasible to have very few select hotshots on a full scholarship. So what I meant is that unless a student is one of those elite few, they should rethink their career plans. April 26, 2017 at 05:07 PM · I thought this article had some very practical advice. Although, overall in my reading there is great tension between following your passion and being realistic with finances. This recent article from the NY Times suggests that we should overcome our "fear" and just do it. (https://nyti.ms/2pdzpUD) I suppose everyone has to weigh the risks and decide what they want to do. It is ignorance about those risks that get people into trouble. Yet, paying debt off is possible! I am a public teacher who paid off my student loans with hard work and blessings. If figured I could always play violin, but teach to pay the bills. It has worked out great! April 26, 2017 at 05:56 PM · Now the universities are cleverly shifting the debt burden to parents, so they saddle the student with "just" $6,000 a year, but the parent with $30,000 a year, on top of the $20,000 per year they are expected to pay out-of-pocket. It's just not possible to do for most families, so it will be interesting to see what choices start evolving. I'm seeing more and more advice that discourages taking on the debt. Here is another recent one: My Son Was Accepted to a College He Can't Afford. Now What? All those stories used to carry the message, "Go for it, live your dream, it will be worth it!" Instead, that story ends with, "The only thing I know is that (my son) is avoiding a crushing debt burden. For now, that’s good enough." The narrative is changing, my friends. April 26, 2017 at 06:22 PM · Thanks for your comments, all. Scott Cole: That $30K figure represents approximate total income and is derived from the SNAAP data, which compiles info using self-reports from tens of thousands of arts graduates (see the link at the end of the article). To me, such an income is unsatisfactory for someone with a master's degree. I.e., it equates with a full-time job paying $15/hr - people without even undergraduate degrees often earn similar amounts and more. William Rhoden: I appreciate you bringing up the inner tension issue. Musicians who develop multiple interests and a variety of income streams can simultaneously pursue their passions and prepare to thrive in the job market (as you seem to have done). I've learned that the key is to learn about oneself and the world of work so that it becomes possible to find a balance. Conversely, music students who naively borrow money to earn advanced degrees in music performance, without considering their employment and work prospects, set themselves up for financial disaster, as was the case with the singer quoted in my article. April 26, 2017 at 07:15 PM · Laurie - Thanks for the thoughtful comment and link. I expect that the student in the article you shared will get a fine education at his in-state school, an education that's comparable to what he would have obtained at the out-of-state institution. And if he wants to transfer, a solid internship plus outstanding grades could earn him added scholarship funding from other universities. As you say, the higher ed landscape is changing, and people are wising up to the perils of too much education debt. In fact, as has been widely reported, the US government is holding more than $1.2 trillion in outstanding student debt, which they loaned and continue to loan to teenagers and others without regard for the borrowers' ability to pay it back. It pains me to witness the devastation that the federal loan program has caused, which motivated me to post this article. Regarding music students, the traditional undergraduate curriculum seems woefully out of date. Music colleges commonly function like trade schools, and they graduate thousands upon thousands of narrowly skilled performers who are prepared to work for employers such as orchestras that, nationally, have only handfuls of full-time vacancies each year. A generation ago, one could argue that narrowly educated music graduates would still be competitive for diverse good-paying jobs because employers would train them, and companies valued their work ethics and team skills. In today's world, though, employers expect graduates to be far more comprehensively job-ready - i.e., able to demonstrate accomplishments with IT, communications, problem solving, leadership and other skills. Here's how the National Assoc. of Colleges and Employers defines job readiness. Also, let's affirm that education is valuable for its own sake - I'm not saying that vocationalism is the exclusive answer to the student loan problem. But the financial equation still has to balance out for students and their families. All in all, I think that education hasn't kept pace with the times. Students do well, therefore, to expend the effort to work out numerous options for obtaining high-quality, 21st-century educations without incurring excessive debt. April 27, 2017 at 02:42 AM · Timely article. I was fortunate that I went to college in the 60's and early 70's when the costs, especially of state schools, wasn't so far out reach for the average earner. The major university in my state, University of New Mexico, figures that the costs for a full time student per year is a little over 21,000 dollars. That is cheap compared to major private schools but, spending 4 to 5 years in getting a degree that may end up being worthless or nearly so is maybe not the smartest decision. I wish it weren't so. A music degree is, to me, a very valuable thing but in terms of future earning power??? April 27, 2017 at 07:07 AM · Frankly, I don't think any degree is a sure thing to earning power anymore. We simply have more people with advanced degrees than related jobs available, no matter what the profession. Couple that with the continued shipping of American jobs overseas, and you have generations of debt slaves on the horizon. Soon, you will have to have a masters degree of some sort to work entry level at Mcdonalds. It's depressing. People can't assume that lenders and schools have the student's best interest at heart. Yet, that is the image they project. Student's and parents beware! Laurie - I wonder how long parents will stand for the split cost? April 27, 2017 at 03:42 PM · There are lots of ways to think about student debt. But let's say one of your strategies for avoiding debt is to "work your way through school" by taking a job as a waiter in a restaurant or tending bar. Let's say that job pays $20 per hour including tips and after taxes, which might be reasonable for a bartender. And let's say you work 20 hours per week. So you're making $400 per week. Now let's say that your part-time work causes you to withdraw from a couple of courses or take a lighter schedule which results in having to stay in school for an extra term. Working 20 hours per week could easily cause that much delay in graduation unless your major is something really lame. And let's say you're at a state school where your in-state annual tuition and mandatory fees are $13000 which is what they are where I teach (Virginia Tech). That means the extra term costs you $6500. That means you are going to work your part-time job 16 weeks -- one full term -- just to cover the tuition for the extra term that you'll have to go to school. And if the best job you can get earns $10 per hour after taxes, and if it's out-of-state tuition that you're paying, then that's two full academic years that you're working just to cover the extra term. I say it's not worth it. As long as I have money in the bank I won't have my daughters waiting tables, tending bar, or working retail when they should be focusing on getting better grades and enjoying the full range of academic and other genuinely enriching opportunities that college offers, because those are the things that will strengthen their transcripts and CVs and increase their earning power dramatically after graduation. Please don't tell me that they'll learn "teamwork" or "organizational skills" by tending bar in a college dive or checking out customers at Target. If you're a young student reading this, ask if you can help cook a week's worth of suppers and put that into Rubbermaid containers for the whole week so that your family never has to eat in a restaurant. Good place to start is a pot of chili or red spaghetti sauce. The average family blows an enormous amount of money on restaurant services. If you can save $50 per week by avoiding restaurants that's $2500 per year. Over an 18-year childhood you save $45000. All of that goes in your 529 account and it pays for two years of college. (And if dad's getting a new car every three years and you're taking out college loans, then something is wrong with dad's priorities.) This is how my parents paid for all three of their children's private-school educations -- by being very frugal. I'm planning to pay it forward. The other thing that really helps is to buy a home you can actually afford.